Not that long ago, we at Feeling Gloomy NYC declared Brooklyn was dead. Sort of tongue in cheek, right? It was prompted by the closure of Glasslands, the latest in a series of great W’burg venues and bars to close. Well, guess what? Now to our chagrin, our home away from home–the Grand Victory, is closing too. Sure, it’s reopening in a new location in some other neighborhood, and you’ll be able to find us there, and probably Feeling Gloomy will operate in Bushwick in a month or two. BUT, it’s high time we admitted it: Williamsburg, this time you’re really, really dead to us. Maybe you already made up your mind to avoid Williamsburg years ago, but we can still remember our first Williamsburg dance party, held across the street at Luxx, which was later Trash Bar, which now is nothing, which tomorrow will probably end up an artisanal mayonnaise place, although we hear artisanal mayo is getting gentrified too. Anyway, stick in a fork in Williamsburg. It’s time we made our Willexit. Feeling Gloomy has been a thing in Williamsburg for a little over three years, and we decided that if we’re leaving, we’re going to go out in style. Not only will we have a dance party for the ages, we’ve also booked all the bands for the night. We’ll start with the synthscapes of ORDER OF OPERATIONS, followed by the arrestingly icy sounds of GHOST COP, and culminating in our brothers and sisters in bedsit woebegonity, the epic and scintillating MY FAVORITE. – A DIY selfie booth where you can express your sadness over gentrification in written form, and also take Instagram pictures (or Myspace photos if you want to get old skool Wburg). 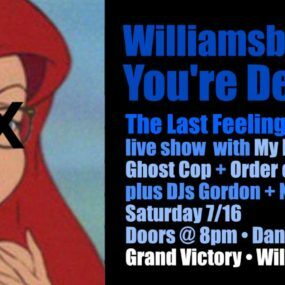 Also noteworthy because it will be the last DIY thing in Williamsburg ever.